Cut Notes: 73 professionals at 3-over-par 147 from a field of 117 professionals and three amateurs. Weather: Thursday: Mostly sunny with a high of 83 degrees. Winds SW 8-15 mph. Friday: Partly cloudy with light showers throughout the day and highs in the upper 80s. Winds SSW 15-30 mph, with gusts over 40 mph. Due to a dangerous weather situation, play was suspended from 2:36 p.m. until 2:58 p.m. Play was again suspended at 4:49 p.m. and resumed at 6:16 p.m. At 7:07 p.m. play was suspended for the day due to dangerous weather conditions and heavy rain with 42 players still on the course. The remaining players returned at 7:30 a.m. Saturday morning to complete their second round. Saturday: Mostly cloudy with a high of 83 degrees. Winds SSW 15-25, gusting to 30 mph. Sunday: Mostly cloudy with a high of 76 degrees. Winds W 10-15 mph, gusting to 20 mph. 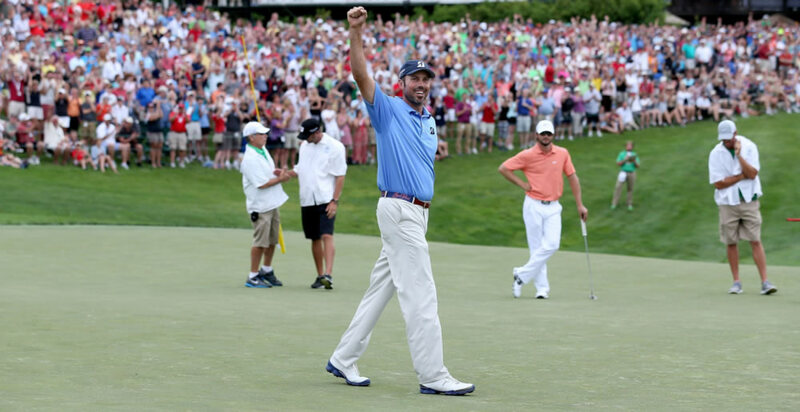 DUBLIN, Ohio -- Most of the perks from winning the Memorial were evident to Matt Kuchar soon after his 20-foot birdie putt tumbled into the final hole Sunday. He looked just beyond the 18th green to where 3-year-old son Carson was giving a high-five to tournament host Jack Nicklaus. He had the first multiple-win season of his PGA Tour career. Kuchar went to a career-best No. 4 in the world ranking. He is all but assured of returning to Muirfield Village in October as part of the Presidents Cup team. "To walk off the green and to greet Mr. Nicklaus and have him congratulate me, that's something I'll certainly never forget," he said. Perhaps the greatest benefit was one only Kuchar could feel -- confidence. And that's a big deal with the U.S. Open approaching. Kuchar missed only one fairway and held off a hard-charging Kevin Chappell over the last three holes to close with a 4-under 68 for a two-shot victory. The win came one week after he was runner-up by one shot at the Colonial. "Great golf breeds more great golf," Kuchar said. "Winning tournaments breeds winning more tournaments. Anytime you can get comfortable playing in that final group, finishing off a tournament, winning a tournament is a huge amount of confidence. Heading into Merion, I'll have a lot of confidence. "I'm looking forward to my chances there at Merion." He sure played the kind of golf that goes a long way at the U.S. Open, which starts June 13 at Merion Golf Club outside Philadelphia. Muirfield Village was such a demanding test that Tiger Woods had two triple-bogeys in the same tournament for the first time since 1997 and wound up with the second-highest tournament score in his career at 8-over 296. "It happens. It happens to us all," Woods said. "Go home next week and practice." Not having Woods around didn't make the task any easier for Kuchar. Right when he thought the tournament was in hand, Chappell birdied three of his last four holes. Two shots behind going to the 18th, Chappell stuffed his approach to tap-in range for birdie. Kuchar needed only two putts from 20 feet for the win, and instead he rolled the birdie putt into the hole and thrust his fist into the air as he smiled. He's always smiling, and he had good reason on this day. He joined Woods has the only players to win more than once this year on tour -- Kuchar also won the Match Play Championship in February -- and his game is peaking heading into a summer of majors, the one missing piece for the 35-year-old American. "His bad shots hit greens. And he's really good with the putter," Chappell said. "And he just doesn't make very many mistakes." Chappell, who missed four birdie attempts inside 10 feet on the front nine, still closed with a 68. He played his last 25 holes without a bogey. Kyle Stanley ran off four birdies in a five-hole stretch to end the front nine and pull within one shot, but he fell back with a bogey on the par-5 11th and never caught up. Stanley fell out of a tie for second on the 17th hole, and it was costly. A runner-up finish would have put him inside the top 50 and allowed him to skip 36 holes of U.S. Open qualifying on Monday. He closed with a 71 and finished alone in third, which will move him to just inside the top 60. The top 60 after next week are exempt to the U.S. Open. "Mentally, I'm pretty drained right now," Stanley said. "I would have shot a million this week if I didn't make putts. So I'm really happy about that." Kuchar finished at 12-under 276 and will be looked upon as one of the favorites in two weeks at the U.S. Open. "There are a couple of things I thought were missing from my pedigree," Kuchar said. "A major championship is on the list, and a multiple-win season was on the list. That's something that at the beginning of the year when I set goals, I wanted to have a multiple-win year. And making the Presidents Cup team was on the list. ... To have kind of sealed the deal with winning this tournament feels really good. "Having a multiple-win season is nice to be able to check that one off the list." Nicklaus offered some help on that other item. "If Matt would ask me, 'What would you do coming up with Merion?' I would only," Nicklaus said before Kuchar leaned into his microphone and interrupted him. "What would you do coming up with Merion?" Kuchar said. Nicklaus suggested going a week early, as he always did in winning his record 18 majors. By the time Nicklaus was done talking, Kuchar was making plans to go to Merion on Tuesday. Rory McIlroy closed with a 72 and finished 18 shots behind. Kuchar was at his best off the tee. He didn't miss a fairway until the 17th hole, when he found a bunker to the right of the fairway. Chappell, coming off a 10-foot par save on the 16th hole, made a 20-foot birdie putt on the 17th to get within two shots. Kuchar had to make a 5-foot par putt to keep the two-shot margin, and Chappell kept coming at him. He started walking after his approach to the 18th when he hit it. "There at the end, it got scary," Kuchar said. "He made a great run at the end." Kuchar never looks as though he is under much stress, and for so much of Sunday, he wasn't. Starting the final round with a two-shot lead, he made a 15-foot birdie putt on the opening hole and led by at least two shots for all but two holes.